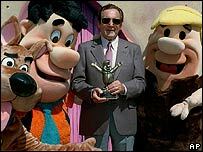 William Hanna and Joseph Barbera are so linked with these Saturday morning cartoons from the 1950s onwards that the fact that they created Tom and Jerry back in the 1940s is sometimes overlooked. That's quite a body of work! Here's a very old cartoon of mine, by way of a "tribute". This appeared in the now-defunct Saturday "Metro" section of The Times back in about 1998.
the word genius springs to mind. genius is not wrong! 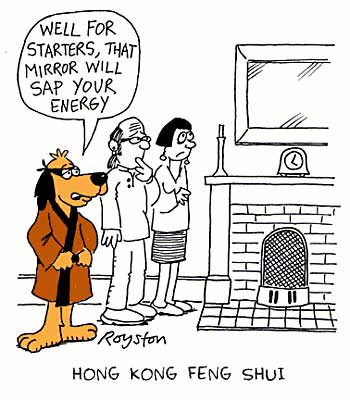 Do you sell copies of your cartoons to humble readers or just media tycoons? I sell them to whoever wants them, Trina. Can't afford not to! 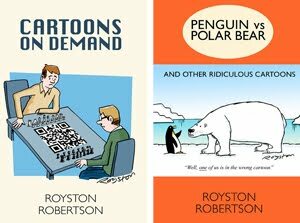 If you visit my main cartoon site at www.roystonrobertson.co.uk you can email me from there.